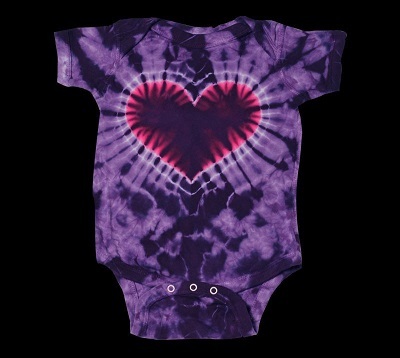 You'll love how she looks wearing our purple heart tie dye baby onesie. Heart the little hippie and dress her in this 100% cotton tie dyed baby onesie with crotch snaps, lap shoulder neck opening for easy dressing. Full-cut for better fit over diapers. Rib knit binding at neck, arm and leg holes. As with all of our tie dye, no two are alike.